Sega Master System (SMS) was an 8-bit video game console released by Sega in 1985. Its original Japanese name was Sega Mark III, but Master System was also used in Japan. The sale on the European market was comparable with its main competitor, Nintendo Entertainment System. But thanks to its large availability, it failed at the North American and Japanese markets. 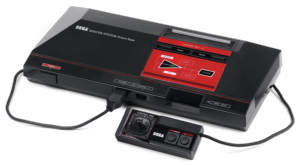 Master System came as a direct competitor to the NES in the third generation of game consoles. Her successor, Sega Game Gear was handheld Master System console the with a few improvements. Both the Mark III and the Master System possess two slots for game input: one for ROM Cartridges and one for Sega Cards, along with an expansion slot and 2 controller ports. Input for Sega Cards used small card with the size of a credit card, similarly to the PC Engine / TurboGrafx-16. Cartridges have a much higher capacity, while the cards were much smaller and were used for cheaper games. 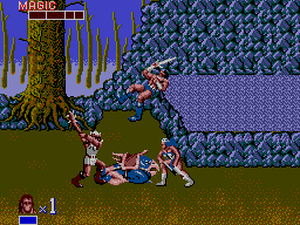 3D glasses were connected via Sega Card input, and allowed the 3D effects for specially designed games. By this way, both inputs worked together. In case of Master System II, card input has been removed, and only cartridges were used. It helped to reduce the cost of production. Since the cards were unpopular, only a few games were released on Sega cards and most of them were later rereleased also on cartridges. There was also an attempt to create a floppy drive like for the Mega Drive but it never came out into sales. The game controller of Master System console had only two buttons, one acted as a Start button, while pause button was directly on the console. The controller used a 9-pin connector and could also be connected with consoles: Atari 2600, Atari ST, Commodore Amiga, Commodore 64, Amstrad CPC and ZX Spectrum. Among the other controllers, it should be mentioned the Light Phaser. The Light Phaser was light gun created for the Master System console and was heavier than its counterpart Nintendo Zapper. It had more sensitive trigger and more accurate aiming. Sega also developed 3D glasses SegaScope 3-D, which used a small LCD screen, rapidly changing between left and right lens, creating two different images synchronized with the TV in order to create a stereoscopic 3D effect. The same technique was used with similar glasses for some 3-D movies in theaters, although these are mostly replaced with new technology. But there were only eight 3-D games compatible with the Master System. In 2006, Master System was reissued in the form of a small handheld console powered by three AAA batteries. The console had its own screen and included 20 games originally released for the Master System and Game Gear. All information in this article are from: http://www.wikipedia.org/.